Of Dow's many roles, she is perhaps best known for portraying the 'rapping granny' in the movie "The Wedding Singer" (1998). 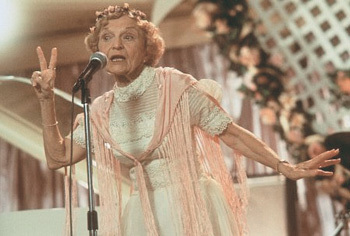 Ellen Albertini Dow '35, the "rapping Granny" from the film "The Wedding Singer," attributes her long career as a choreographer, teacher, and film and television actor to a man many no longer remember: Professor Alexander M. Drummond. Despite having studied with such luminaries as Martha Graham, Jacques LeCoq and Marcel Marceau, Dow says it was Drummond who made her a success. "It could only have happened because I knew how to move, how to concentrate, how to be thoroughly prepared -- in other words, professional." Drummond arrived at Cornell's Department of Public Speaking in 1907, and taught the first drama courses offered for credit. He served as chair of the department from 1920 to 1940. Under his leadership, Cornell theater expanded from a small group doing one-act plays in a Goldwin Smith Hall to more than 400 students producing plays on a Willard Straight Hall stage. 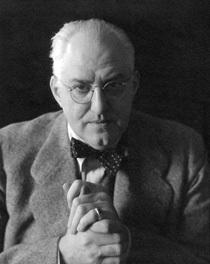 Professor Alexander M. Drummond, chairman of the drama department at Cornell from 1920-40. Dow bears little resemblance to the shy, timid girl who first encountered the legendary Drummond. Under his tutelage, the first-generation American from a small coal town shed her Pennsylvania Dutch accent and found her place in the world of theater. She spent time in New York City directing and choreographing plays and operas and then headed to California to teach and help build Pierce College's theater department. After her retirement, she began a thriving second career in television and film, with roles in such movies as "Wedding Crashers" (2005) and "54" (1998) as well as appearances in almost 100 television shows. At an age when most people have stopped working, she's still in great demand and still auditioning. The recent occasion of Dow's 75th Cornell reunion (which she was unable to attend) gave her reason to reflect on the irony of Drummond as her mentor. He "did not admire Hollywood or even the Group Theatre," as Dow delicately puts it. A 1952 Ithaca Journal article quotes film star Dan Duryea '28 saying that although Drummond was the person who most influenced his acting, he was also the person who advised him against becoming a professional actor. Instead, Drummond envisioned a nonprofessional stage company in every U.S. county. Toward that end, in 1919 he created the Little Country Theatre at the New York State Fair, where members of the Cornell Drama Club transformed an old fairgrounds barn into a theater. Its one-act plays and lectures on theater production by Drummond were seen by 6,000 fair-goers that first year and 12,000 the next. 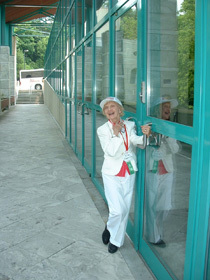 Ellen Albertini Dow '35 stops by the Schwartz Center in 2005 during her 70th reunion. Drummond helped organize the Cornell Dramatic Club in 1909, and served as its director from 1912 to 1947. As Drummond recalled in a 1954 Cornell Daily Sun interview, "We didn't have many women in the club. Cornell women were stubborn in those days. Most of them refused to join a male-infested society, so they formed their own group. Only a few stuck it out." Dow did, and became one of a handful of women to serve as Drummond's assistant director. "He was the boss, in the highest meaning of that word," says Dow, adding that no one ever called Drummond by his first name, no matter how well they knew him. Drummond believed in disciplined professionalism. If he smelled liquor, "you would never work another second," says Dow. "No second chances with him." But despite Drummond's high standards, he had fun in his work. Dow recalls laughter and jokes and always a sense of humor. Perhaps that's why he was able to see Dow's potential as a comedian, despite her insistence that she was a very serious person in college. Drummond gave Dow the role of midshipman in "H.M.S. Pinafore" and told her to do whatever she wanted -- mime, slapstick -- and he'd tell her when to stop. 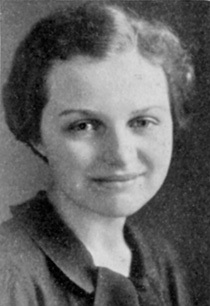 Dow (as Ellen Rose Albertini) in the 1935 edition of The Cornellian. Bailey Hall was packed on opening night. "I didn't even realize what was happening," recalls Dow, "but the audience was roaring with laughter." The New York Times gave the show a rave review. "Even after you left Cornell, Drummond remained your teacher and friend. He was an inspiration for life," says Dow, who remembers him sending "little card notes and messages, always urging you on when you had doubts. Always 'you can do it.'" In his time at Cornell Drummond directed hundreds of plays, wrote several of his own and passed on his knowledge to thousands of students, including actors Dorothy Sarnoff '35, William Prince '34 and Franchot Tone '21; playwright Arthur Laurent '37; director Alan Schneider '41 and screenwriter, producer and director Mel Shavelson '37. Drummond died Nov. 29, 1956. "We all loved him for the gift he gave to us," says Dow.